This compelling advice from Mike Caro helps you beat seven-card stud, even at a professional level. A report, not a book. No filler or stories. Just solid tips and tactics packed into 32 large pages. When to suspect that your opponent has a small hidden pair. Page 6. Accurate seven-card stud odds. Page 32. 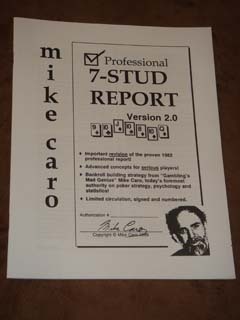 Organized in an intelligent way that makes Mike Caro’s seven‑card stud teaching easy to apply. All the seven-card stud essential ingredients of winning. Plus, it’s peppered with concepts and guidance you’re unlikely to find anywhere else. Personally signed by Mike Caro and numbered. No-nonsense winning advice for serious seven-card stud players. This extremely valuable edition to your poker library contains the answers you need to win at seven-card stud. Mike Caro takes his standard world-class training and cranks it up a level for more‑advanced students and dedicated competitors.